Last summer we spent 15 days in a caravan in Austria and Switzerland. It was the longest I’d ever stayed in a caravan during peak camping season in Europe. The concept of sharing a relatively small space with my family took some getting used to and at times it also felt like half of Europe was sharing with me, too. Regardless, I fell in love with the simplicity of the camping life. That trip inspired the SFT spring series “Let’s Go Camping” where I can share discoveries with anyone who cares to benefit. Each Friday in spring we are featuring a new campground in and around Switzerland as well as camping hacks and tips to make your experience more enjoyable. Today’s location is just over the border into the Tirol region of Austria: the campground Seeblick Toni. Seeblick Toni is a 5 star rated campground located on the Reintalersee in Tirol, just a 40 or so minute drive past Innsbruck in Austria. From Switzerland the drive is an easy one, assuming Austria’s longest road tunnel, the Arlbergtunnel, is open. To use the tunnel and the Albergschnellstrasse (highways) the cost is 10 euros each way. To avoid the tolls or if you are unlucky and the tunnel is closed for maintenance as it was for us in the summer of 2017, the other option is to detour of over the 1793m high Alberg mountain pass. It’s a beautiful detour but with a caravan it meant we put our car breaks to the test driving down the steep pass road. Toni’s Seeblick has a variety of accommodation options on offer. Standard pitches start from 80 m2 and include electricity and fresh water and pitches go up to 120-140 m2 for the comfort pitch plus (new as of 2018). I must admit my initial reaction when we arrived wasn’t positive. I was shocked how close each site was to each other. But hubby reminded me that this is exactly how camping is in Europe. We ended up with a great spot close to the lake with a small green hill directly behind us so were lucky to not feel too looked over and I soon lost that disappointed feeling. But be warned: if you are new to camping in Europe, you may be disappointed with the close quarters. Toni’s Seeblick also cater for travellers without tents and caravans of their own. Options include renting a caravan or bugalow, going a little more luxury and renting an apartment or you can choose the fun option of sleeping in a barrel! Our home for the 7 nights. We were able to fit our van across the pitch so we could use our Outwell Awning. Looking across to the main building with restaurant, shop and bathrooms you can spot the cute barrel accommodation. We chose this campground because of all the great facilities it had on offer. The comfort pitch we rented included access to the very clean and well maintained bathrooms in the main building. The kids LOVED visiting the special aquarium themed kids bathroom which was all accessed by an arm band we were given on arrival. The campground has a great restaurant that we visited a couple of times and a basic supermarket from where we collected our bread each morning. It also has a fast food truck serving sausages and pommes frites as well as pizzas. The site also had a laundry room with a drying room. Apparently this song is a long standing tradition at kids disco here in Europe. There is an indoor playground and gaming room for the wet days. And for sunny days head to the back of the campground to find a nature playground and trampolines (additional fee). There are free go karts for the kids to use and ride around on the site. The lake is the highlight with a small grassed area next to it reserved for the Seeblick guests. The neighbouring campground has a huge grassed area and playground which you can use for an additional fee ( 8 euros per family per day - and yes they check and kick you out if you haven’t paid). There is another swimming area towards the end of the camping ground as well. Go Karts are free to use. Looking over the back part of the campground including the playground. Looking back onto the campground you can just make out the neighbouring campground with their much larger green space by the lake. We purchased our fresh bread each morning at the campground store for breakfast and lunch. Dinner we changed it up between making fondue and raclette we brought from home (we never did find good Austrian cheese so happy we did) and eat at the restaurant onsite. Don’t miss the traditional Austrian dishes like Wienerschnitzel and desserts like Kasierschmarren. There is a fish restaurant called Fischerstube around the other side of the lake but we never tried it out. We enjoyed some traditional Austrian food at the Hotel Landgasthof in Gappen just a 5 min drive away which also had a popular pizzeria. Book in advance as they were full! We purchased a small amount of products on site but did our big shops at either the big Spar (about a 10 min drive away close to the highway) or in the bigger Shopping Mall in Schwaz. Don't leave Austria without trying Kaiserschmarren! The walk around the Reintalersee is lovely, check out the restaurant Fischerstube in the background. Making do with what we have with some fondue we purchased in Switzerland. 6. What to see and do outside the camp site? There are so many things to do see in do in the region we didn’t even scratch the surface. 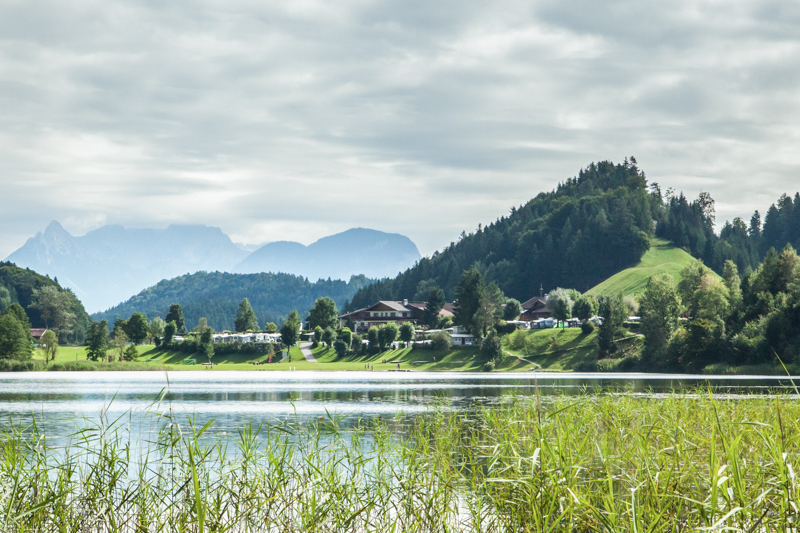 A day trip into Innsbruck or visiting the Crystal World of Swarovski in Wattens were all options but we decided to take it easy with strolls around the Rheintalersee and lazy days reading books and swimming in the lake. On a rainy day we spent the afternoon at the Schwaz Planetarium. Staying in the region includes the Alpbachtal Seenland Card which offers lots of different perks including free use of the Widersbergerhorn gondola. This is a hiking trip the kids will love. We first hiked from 1880m to 2128m to the peak of the Wiedersbergerhorn mountain and rewarded the kids with a visit to the adventure playground “Lauserland” on our decent. Z was the only one wasn't out of breath at the top of the Widerbergerhorn. The pitches are mostly stone, so make sure you have a mat for out the front of your caravan or tent to make it more comfortable, we needed to go get one on our first day. We were also glad to of brought along the scooters for exploring the large campground. Really an awesome kids club. We booked directly through the campground by email. While we found them very friendly per email, the reception staff on site were however less than friendly. Rude and grumpy is no exaggeration; I don’t think they enjoy their job very much. Thank goodness we didn’t have to interact too much with them. The staff in the restaurant and around the grounds were a lot friendlier. But sometimes that first impression is the most important. Sunrise over the Reintalersee on our last morning. The entry to the campground is confusing and we first drove into the entrance of the neighbouring ground. They were quite aggressive and were trying to convince us to stay with them. I can see there is fierce competition between the two grounds. Also watch out for the grumpy receptionists- don’t let that put you off. Here you get a good overview of the campground. The lake is camera left. This campground lakeside location is great for a summer holiday as is the fabulous kids club and proximity to great hiking. If you asked the kids, they would want to go back in a heart beat. They made friends, had freedom to roam and loved the kids club. If you ask the parents, we probably wouldn’t revisit. We much preferred the laid-back atmosphere of the Yverdon campground we visited directly after. We are a family 5 who are willing to try it all. From cabins to caravans, motor homes to roof top tents. All us adults need is a comfortable place to sleep and a clean bathroom to use. The dream is to own a VW Camper but until then we enjoy either renting one, or enjoying other things that campsites have to offer. Despite the rainy days, despite the grumpy receptionist, despite the sardine in a tin feeling we had a fabulous break here.